Elk husbandry addresses issues of animal welfare in balance with normal farm management requirements, with consideration given to: 1) physical and behavioral needs of farmed elk, 2) humane treatment, 3) human safety, 4) ease of animal management, and 5) farm success. Elk are adapted behaviorally and physiologically to regional environments. Elk have strong annual cycles of reproduction and metabolism that are synchronized by photoperiod (day length). These adaptations allow elk to thrive in all regions of North America and capitalize on the seasonality of vegetation growth. These regional adaptations guide the elk farmer's selection of pastures, facilities and husbandry systems. 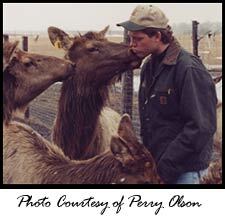 In general, elk operations are similar to horse and show cattle operations.